Is your pet slowing down with age? Are they stiff and slow to get out of bed? They may be showing signs of pain due to arthritis. There are many ways Vasse Vets can help your pet regain mobility and comfort! Arthritis simply means ‘inflammation of the joints’. 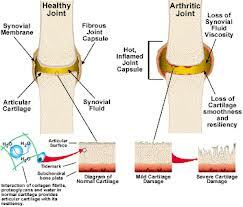 When arthritis occurs the cartilage lining of the joint is damaged, which causes inflammation and pain. The cartilage lining can wear down because of disease, poor structure or development (eg hip dysplasia), unusual gait or conformation or excessive weight gain. Stiffness or slowness when getting up or down, and after resting. Difficulty going up or down stairs or for cats, unwillingness to jump. Reduction in activity or a reluctance to exercise. Often the pain with arthritis is worse after resting, vigorous exercise or cold weather. A thorough physical examination by a veterinarian can find areas of pain or reduced mobility. Taking an x-ray of the affected area can help to rule out other causes of significant joint or bone pain, such as fractures, dislocation, cancer, infection and ligament damage. Osteoarthritis cannot be cured, however the pain can be controlled and the progression can be slowed. Management of arthritis is based on three main factors: weight control, exercise and treatment/medication. Other factors like warmth, proper bedding and surgery can also be beneficial. A 4-6 monthly revisit is normally required to adjust your dogs’ arthritis plan and modify their medication if required. Managing osteoarthritis in your pet often requires a combination of different therapies tailored to each individual dog. Don’t be daunted by the many treatment options available, book an appointment with Vasse Vets and we will tailor an arthritis plan for your pet and lifestyle. This is one of the most important management factors of arthritis. Keeping dogs at a lean body weight reduces joint strain and pain. Dietary management with a calorie controlled diet like Royal Canin Satiety plus gentle exercise is required for weight loss. Vasse Vets runs a complimentary weight loss clinic which will tailor a specific diet and weight loss plan for your pet. Feel free to ask for more information at your next visit. The ideal body condition for a dog is ribs that can be easily palpated but are not visible, a waist and an abdominal tuck. How does your dog measure up? Regular gentle, low impact exercise in the form of swimming and walking are best for dogs with osteoarthritis. Try and avoid short, intense, high impact exercise (i.e. ball throwing, jumping, running) as these often aggravate sore joints. Physiotherapy exercises are also beneficial in building up muscles around sore joints to help reduce joint strain. Vasse Vets has an animal physiotherapist who will formulate a specialised management plan for your dog to help them become more mobile and lead a better quality of life. Ask for a referral at your next visit. Treatment options are varied and include joint diets, supplements and prescription medication. Joint diets: Omega 3 and 6 fatty acids help block the inflammation around joints that causes pain. They also suppress the activity of an enzyme that causes cartilage damage, thus slowing the progression of arthritis. Prescription joint diets are calorie controlled diets high in antioxidants and omega-3 fatty acids and can greatly benefit arthritic dogs. Examples of prescription joint diets include Hills J/d and Royal Canin Mobility Plus. Omega oils can also be added to other diets as an inexpensive supplement called Omega Magic. Antinol joint supplement: Antinol®is an all new natural joint treatment containing a fatty acid group called PCSO-524®. With no known side effects, the PCSO-524® contained in Antinol® has assisted millions of dogs around the world to enhance their mobility and start moving again. Antinol® is fast acting so you can expect to see results in just 10-14 days. Cartrophen injections: Pentosan polysulfate, otherwise known as Cartrophen, is an arthritis modifying drug which can help to prevent cartilage break down and has an anti-inflammatory effect. It is administered as a course of 1 injection per week for a total of 4 weeks. The course is repeated every 3-6 months. Prescription medication: Anti-inflammatory and pain relief medication helps to control the inflammation and chronic pain associated with arthritis. Vasse Vets uses an anti-inflammatory called Meloxicam, which is a honey flavoured liquid given by mouth with food. Other medications like Gabapentin, Tramadol and Amantadine can help with chronic neuropathic pain often associated with long term arthritis. Anti-inflammatories will not slow the progression of the disease and are best used in combination with other modes of treatment. Dogs going on long term pain medication require a re-assessment and blood tests every 6-12 months to check their liver and kidney function. Warm, supportive bedding: Other things that can help make your dog’s life more comfortable include moving their bedding off the ground and indoors in cold weather and making sure the bed is easy to get in and out of. The choice of bedding should be soft and supportive- i.e. memory foam. Keeping your pet warm in winter with coats and warm bedding also helps ease joint pain. Stem cell therapy: Stem cell therapies where purified and processed stem cell preparation is inserted into arthritic joints under anaesthetic is now available. These therapies, whilst quite new, have been producing good results on arthritic joints. Surgery: Osteoarthritis is often caused by an underlying condition- i.e. 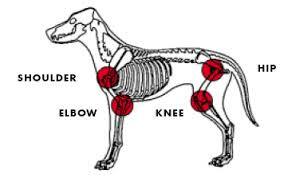 cruciate disease in the stifle or hip/elbow dysplasia in the hips and elbows. In specific cases surgery is indicated to stabilise and improve the joint. Early surgery, where appropriate, will greatly reduce the degree of osteoarthritis in the joint and improve your pets’ quality of life. 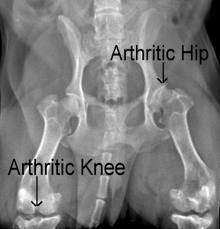 Your vet will discuss surgical options with you at your arthritis consult. If you think your dog is suffering from arthritis, starting a management plan sooner rather than later is recommended as the pain and joint destruction is more severe when arthritis progresses. To book a consultation for a tailored arthritis management plan, please don’t hesitate to give our friendly team a call on (08) 9755 4455.